Why Is It So Hard to Find a Good Wedding Reading? I’m back from my sabbatical! First and foremost, I must extend a massive thank you to my guest bloggers, Lindsay, Cleo, Leigh, and Sergio, for contributing to the Favorites Series while I was gone. If you missed any of their guest posts, I have created a new page for the Favorites Series, and you can read them here. As always, if you’re interested in participating in the Favorites Series, feel free to contact me. As some of you know, I took a break from the blog while my husband and I were doing some traveling in España! Spain was not a random vacation choice. 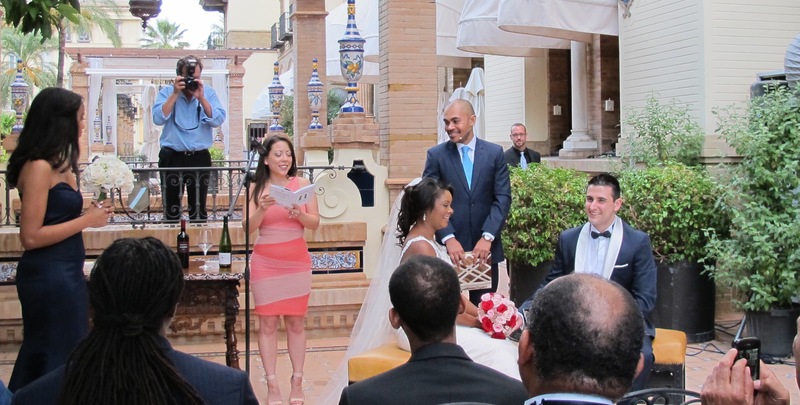 We had a great excuse to go: one of my best friends got hitched in Seville. A little background: the bride, Kellie, and I have been friends for over a decade. We were roommates at an uber-dorky summer program at Georgetown during the summer of 2000, and we were inseparable. Despite living hundreds (and sometimes thousands) of miles apart, we have remained great friends ever since. Kellie is smart, she is hilarious, she is spontaneous, she is kind. And, above all else, she is one of the most fun and fun-loving people I know. As it turns out, she is also very trusting. She proved this when she did something very foolish: she asked me to do a reading at her wedding . . . but she gave me absolutely no parameters. She knew this had the potential to be disastrous; she admitted that she was kind of terrified that I would read the grossly inappropriate lyrics to DMX’s “Party Up,” which was our clubbing hype-song/anthem during the summer we met. Wedding appropriate (this may seem obvious, but it eliminates at least 90% of the otherwise good options). I don’t know if you’ve looked at or thought about wedding readings recently. But, if you haven’t, trust me when I tell you it is not an easy task to find a good one. Allow me to walk you through the process . . . When my book search came up short, I did some Googling. My searches included “unique wedding readings,” “fun wedding readings,” and “interesting wedding readings.” Ironically (but not surprisingly), these searches elicited every reading you have heard at every wedding you have attended in the last fifteen years. I began the painstaking elimination process. These wouldn’t work for two reasons: 1) I already knew that Kellie’s sister was reading First Corinthians, and 2) no one would take me seriously reading anything so sweet or so religious. “Well that’s very odd ‘cos I was too. “Let’s go together,” says Pooh. . . .
Let’s face it: I couldn’t possibly say “Pooh” that many times during a wedding and keep a straight face. Or bends with the remover to remove. . . .
Shakespeare may be an OG, but his sonnets are too formal and too serious for me (and, more importantly, for them). Civil marriage is at once a deeply personal commitment to another human being and a highly public celebration of the ideals of mutuality, companionship, intimacy, fidelity, and family…. 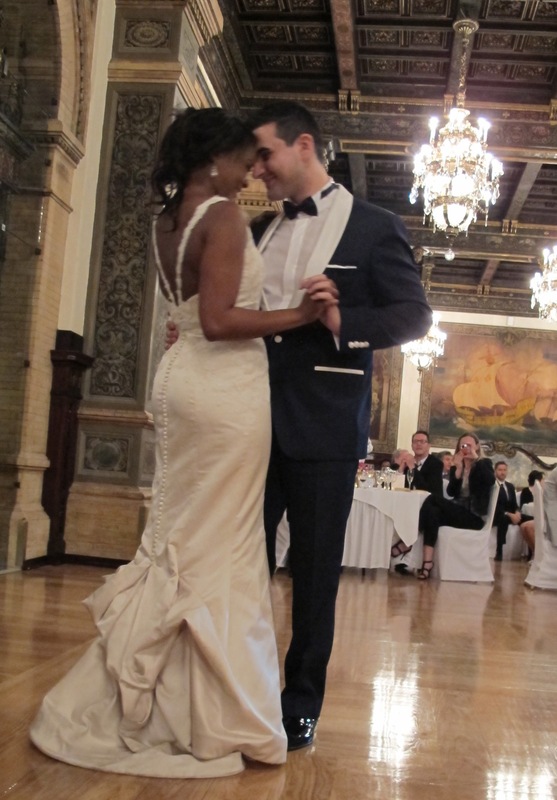 Because it fulfills yearnings for security, safe haven, and connection that express our common humanity, civil marriage is an esteemed institution, and the decision whether and whom to marry is among life’s momentous acts of self-definition. Reading a poem translated from Spanish into English in Spain just seemed wrong to me. And I wasn’t about to attempt to recite the poem in Spanish in front of a bunch of native Spanish speakers. No one wanted that. Especially not me.
. . . and about a billion other recommended readings. None of the go-tos fit the bill. I was at a loss. I thought I might have to read those DMX lyrics after all. But I didn’t want Kellie to hate me, so with our club anthem in mind, I did a search of the top 100 songs of 2000 in the hopes that I could find another lyrical gem that we listened to back in the day. Guess what the #1 hip-hop song in July 2000 was? I was tempted. Really tempted. But I couldn’t bring myself to say “playas” in a wedding reading. It was down to the wire. The wedding was about a week away. I was truly stressing myself out. And then, magically, I felt a spark of inspiration! Huzzah!! I remembered one of the reading suggestions that popped up in my “unique wedding reading” searches many times. It’s a quirky children’s book about a pair of amorous dinosaurs. But it wasn’t perfect–I wanted something a little more personal to Kellie and Marcos. So, I decided to play a little game of Mad Libs with them, and, unbeknownst to them (the reading was a surprise to them on the day of the wedding), they helped me revise the book. The fierce [cocky] Dinosaur was trapped inside his cage of ice. The Lovely Other Dinosaur melted the Dinosaur’s cage with kind [funny] words and loving thoughts [easy-going ways]. He is also quite clever [entertaining] though I will not tell him this for now. She is beautiful [funny] and she is different [intelligent] and she smells so nice [is so pretty]. She is also a free spirit [a loud mouth] which is a quality I much admire in a dinosaur. But he can be so distant [such a know-it-all] and so peculiar [intense] at times, thought the Lovely Other Dinosaur. He is also overly fond of things [blunt]. Are all Dinosaurs so overly fond of things [blunt]? But her mind skips from here to there so quickly [compared to me, she’s kind of lazy] thought the Dinosaur. She is also uncommonly keen on shopping [a little too rowdy]. Are all Lovely Other Dinosaurs so uncommonly keen on shopping [rowdy]? I will forgive his peculiarity [intensity] and his concern for things [bluntness] thought the Lovely Other Dinosaur. I will forgive her skipping mind [laziness] and her fondness for shopping [rowdiness] thought the Dinosaur. Besides, I am not unkeen on shopping [rowdiness]. Together they stand on the hill [in Spain] telling each other stories and feeling the warmth of the sun on their backs. I thought it fit my self-imposed guidelines perfectly. But I was wrong. It was still too sweet and sentimental. I was fighting not to cry pretty much the entire time. I am a bigger softie than I care to admit. And there you have it. Who knew that finding a wedding reading could be so stressful and laborious? The point: If you are asked to do a reading in the future, I highly recommend picking a tried-and-true reading (like this one) and making it a little more personal. Mad Libs work wonders. And, of all the sites I looked at during my painstaking search, this is the best/most comprehensive list of readings–it’s a good place to start a search. The real point: In case you haven’t figured it out already, this post was just an excuse to say congratulations once again to Kellie and Marcos. I love you both. This entry was posted in Not a book review and tagged A Lovely Love Story, Books, Edward Monkton, Unique wedding readings, Wedding readings. Bookmark the permalink. What a kind comment! Thank you!! It is an adorable book and works great as a wedding reading–not too trite, not too mushy, a little funny, very sweet. Glad I could introduce you to it! I loved your reading, what a wonderful idea. i can’t believe that anyone would read from The Princess Bride speech -too funny. Thank you! I was pretty flabbergasted by some of the suggestions for readings I found during my search (The Princess Bridge speech included). To each his/her own, I suppose . . .
you pretty much outlined my exact experience in searching for readings for my own wedding last month. it’s hard! (i settled on an excerpt from rilke’s letters to a young poet and a self-tweaked adaptation of oh the places you’ll go, which worked well despite its graduation-y-ness.) now i have to read for my step-sister’s wedding and she wants something secular and light/fun, so i had to dive right back into the whole horrible search, and it seems like monkton is the best thing out there for what i need. 2 questions about your madlibs solution: (1) did you just ask for, say, 10 positive and maybe 5 less-positive adjectives from each to describe the other, or did you have more specific prompts? and (2) did you keep the reading a secret from them entirely until the wedding day? Because otherwise that would kind of undercut the madlib aspect, no? 3) 1 bad/weird/annoying habit/interest that your soon-to-be spouse has that you actually/secretly really like. This provided me with more information than I needed, so I could make sure that I got responses that fit with the reading. I would recommend asking them separately, too, so they don’t know each other’s responses. Another surprise: I read from a copy of the book, which I had revised and inscribed before the wedding, and which I gave to them as part of their wedding present. If you end up doing this, please let me know how it goes! Good luck and have fun!! I love this so much! Where did you get the book revised and inscribed?? Julie, I revised/inscribed the book by hand (I doubt you could have it done professionally in light of copyright restrictions). Happy to help! If you end up doing this, let me know how it goes! This is so awesome! The title of this blog were my thoughts exactly. Thanks so much for sharing. Your analysis of each classic wedding reading is on point. Glad you enjoyed the post. If you come up with a good reading, feel free to share it here! !